Endoscopic imaging techniques aim for detection of small (even minute) neoplasias and analysis of macroscopic type, microsurface structure, and capillary architecture. Magnifying image-enhanced endoscopy displays surface and capillary architecture of normal and neoplastic mucosa and allows highly accurate endoscopic diagnosis of margins, malignant transformation, and lack of deep submucosal invasion of early mucosal neoplasias, which is fundamental for curative endoscopic resection. 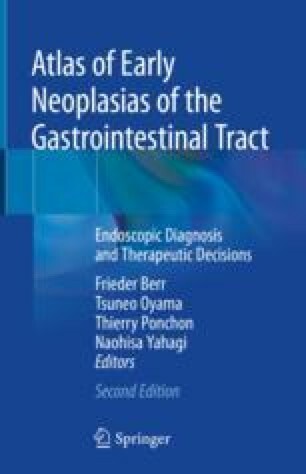 This chapter introduces techniques and diagnostic analysis of image-enhanced endoscopy. The contribution of cases or images by Dr. Hans-Peter Allgaier, Freiburg, Germany; Dr. Gerhard Kleber, Aalen, Germany; Dr. Tsuneo Oyama, Saku Central Hospital, Nagano, Japan; and Dr. Daniel Neureiter, University Institute of Pathology, Salzburg, Austria, is gratefully acknowledged.